The generals’ notions of what it would take to put down the rebellion ran counter to Lincoln’s, whose pragmatic strategy would ultimately form the blueprint for Union victory. He had his work cut out for him: when he took office there wasn’t just an absent system of command, but there had been no planning whatsoever by the previous administrations for war; no preparatory memos or regular briefings by the top brass awaited him. A religion columnist for the Salt Lake Tribune recently looked at an obscure example of Lincoln’s political acumen at work—his relationship with the Mormons in Utah. Many Latter-day Saints greeted Lincoln’s election with dismay; it threatened the Union they believed to be a divine work, and the Republican Party explicitly condemned polygamy. Indeed, in July 1862 Lincoln signed the Morrill Anti-Bigamy Act into law; the act was specifically aimed at Mormon marriage practices and the church’s extensive property holdings. You can read more about Lincoln’s involvement with the Mormons in Gary Vitale’s 2008 article in the Journal of the Illinois State Historical Society, which is available online. —From Collected Works of Abraham Lincoln, Vol. VI, edited by Roy P. Basler. A few weeks ago, PPP found that Green Bay Packers quarterback Aaron Rodgers was the most popular person in any realm on which the company had ever polled. 89% of Wisconsin voters had a favorable impression of him, and only 4% an unfavorable one. In an endeavor to find someone more beloved, PPP asked all American voters about several public figures and someone much more private. Of ten names, the only ones to best Rodgers are Jesus Christ, Abraham Lincoln, and poll respondents themselves. Only 1% of Americans see themselves unfavorably, and 93% have a positive view. The second most esteemed is President Lincoln, of whom 91% are favorably disposed and 2% unfavorably. Then Jesus, with a 90-3 mark. Also very popular are the first president, George Washington (86-3), and Mother Teresa of Calcutta (83-5). Way behind but still very well-liked are Dr. Martin Luther King, Jr. (74-10), Mahatma Gandhi (64-9), Santa Claus (67-13), Nelson Mandela (64-10), and Steve Jobs (62-10). 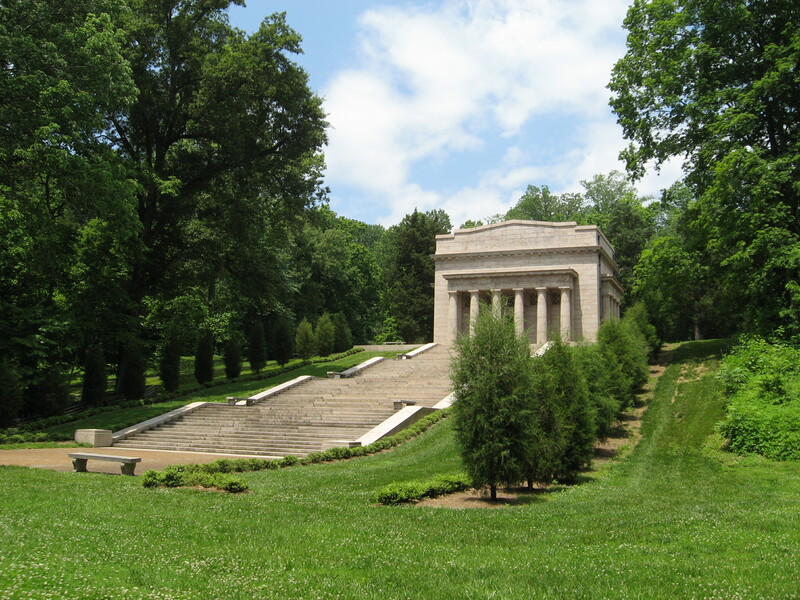 Kentuckians just celebrated the centennial of the memorial building at Lincoln’s birthplace in Hodgenville. Click here for a description of the festivities. Killing Lincoln, the bestseller co-authored by cable news pundit Bill O’Reilly, is in the news right now because one of the Ford’s Theatre gift shops will refrain from carrying it. The store, located in the theater’s basement museum, is operated by Eastern National, the organization that manages National Park Service stores. The lobby gift shop, run by the Ford’s Theatre Society, will sell the book. A Park Service staff member made the recommendation against stocking the book because it contains a number of errors and lacks the usual documentation found in most historical works. Some of the mistakes in the text are minor discrepancies, such as the statement that Ford’s Theatre burned in 1863 instead of 1862. Others are more embarrassing. For example, O’Reilly and his co-author Martin Dugard place Lincoln in the Oval Office, which wasn’t constructed until decades after the Civil War. Such errors can pop up occasionally in any piece of scholarship, but the dearth of documentation in Killing Lincoln is striking even for a popularized history book put out by a commercial publisher; there are no endnotes, just a very brief description of published sources at the end of the book. O’Reilly has framed the affair as a personal battle between himself and a pack of malicious detractors. On his TV show, he stated (hopefully with his tongue in his cheek) that the book has come under attack by “the forces of darkness.” He has referred to criticism of the book as “a concerted effort by people who don’t like me” and claims that “our enemies are full of rage at our success.” That strikes me as a little disingenuous. The store’s decision not to stock the book is essentially a routine bit of internal NPS business. Where O’Reilly’s public stature comes into play is not with regard to Eastern National’s call not to sell his book, but the fact that the media thought that decision was a newsworthy item. Normally a museum shop’s decision not to stock an item wouldn’t be the stuff of national news, but a controversial media personality like O’Reilly makes for an inviting target. He’s therefore vulnerable to a kind of criticism that doesn’t plague most historical writers. Maybe that’s unfair, but on the other hand, most historians don’t enjoy the kind of ready-made visibility that would allow them to publish a poorly documented book and see it instantly rocket to the top of the bestseller lists. For what it’s worth, my issue with Killing Lincoln isn’t so much a complaint about its content as it is a manifestation of perplexity. I’m not sure why such a book needed to be written in the first place. In recent years we’ve seen a number of well-written and carefully researched books on the Lincoln assassination, such as Blood on the Moon by Ed Steers, American Brutus by Michael Kauffman, and Manhunt by James Swanson. These are all scholarly works, but they’re also sufficiently accessible that any non-specialist could enjoy them. Is O’Reilly bringing anything new to the table? He has said that Lincoln was an exemplary leader, and that his desire for Americans to draw on his wisdom helped prompt him to write the book. Fair enough, but if you want to unpack Lincoln’s greatness, writing about the assassination seems like an odd way to go about it. Taking a bullet to the back of the head while watching a play wasn’t exactly the most statesmanlike act of Lincoln’s career. Perhaps O’Reilly decided to tackle Lincoln’s assassination for no other reason than the same pull of the past that’s reeled in countless other history buffs, including myself. If that’s the case, I can admire his enthusiasm, even if I’d be hesitant to recommend his book to anybody else who’s caught the same bug. In any case, the book’s absence from the shelves of the NPS gift shop doesn’t seem to be affecting its popularity. As of this writing, it holds the number two spot on the New York Times list of hardcover non-fiction bestsellers. Cindy Bowman and Kelli Welborn, both of whom wrote dissertations on Lincoln and leadership theory under the direction of Dr. Charles Hubbard, will present some of their research this weekend at Lincoln Memorial University in Harrogate, TN. This program, “Abraham Lincoln’s Leadership: A Framework for Today’s Leaders,” will take place in the Business-Education Building on Saturday, November 12 at 10:00 A.M. The presentation is co-sponsored by the Abraham Lincoln Institute for the Study of Leadership and Public Policy and the Carter and Moyers School of Education. Click here for directions to the campus.